front entrance. There is a separate bedroom with a king size bed. Great view of the ocean. 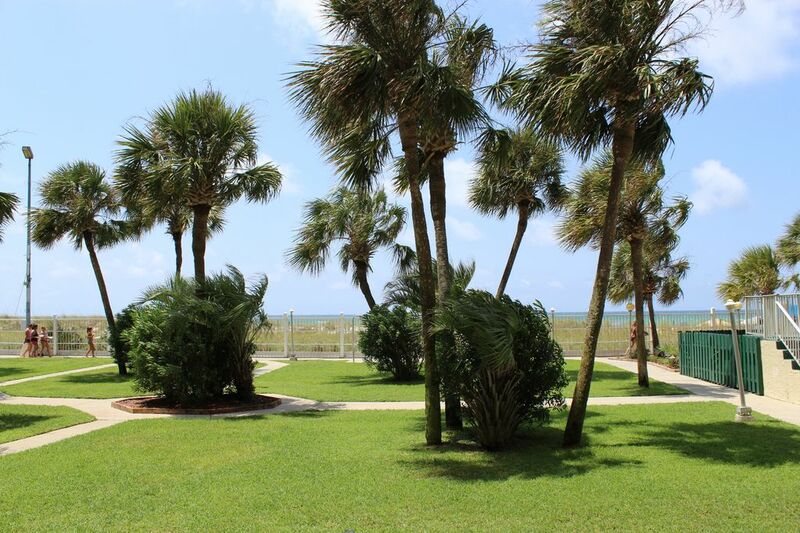 Sit on the patio and enjoy the sights and sounds of the ocean. The Summit is a complete resort condominium. It is one of the largest Gulf front condominiums on the beach. There are swimming pools (one heated), two kiddie pools, hot tubs (two outside and one inside), tennis courts, exercise facilities, game room, tiki bar by the pool, and a bar and grill. Two free beach chairs with umbrella are provided at the beach. We enjoyed being on bottom floor. Room was nice. We would stay here again. Condo was nice and clean and the bed was super comfortable. Love staying there is so convenient to everything. Would love to have a washer and dryer in the condo. Looking forward to staying there again. Love it every single time!! Beautiful unit, most comfortable bed I’ve ever slept on away from home! Can’t wait to go back! Very nice clean room. Owner was so pleasant. Room was clean & ready, & I loved the new large bath towels, so soft & big! We are already counting down the weeks till we return! Bikini Bob's food was better too! tennis,and parasailing. Club LaVella and Spinnaker are adjacent. Shopping, restaurants, clubs, golfing, boating, and fishing are within minutes of this unit. Please confirm your reservation with us prior to making payment. Call or email for rates. Maximum guests 6 No smoking No pets Until confirmed, rates are subject to change. Add 13% tax and a $75.00 cleaning fee to the above rates. A 30 day cancellation is required for deposit refund. Spring Break refundable security deposit is $500.00 .